Kask's new Protone helmet, developed in collaboration with Team Sky, is a highly adjustable, cool and comfortable lid, although it comes at a premium price. 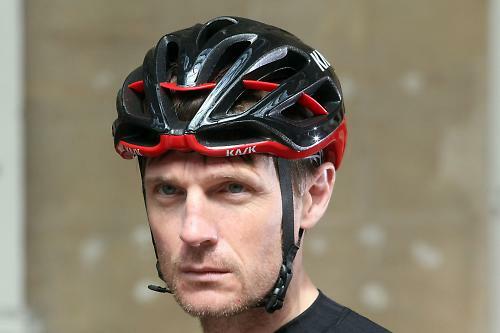 If Kask's claims are to be believed, it boasts impressive aerodynamics for a well-vented helmet too. One other feature that I really like is that the chinstrap isn't simply a continuation of the upper straps – a feature of other Kask helmets. Check out the pictures and you'll see what I mean. The result is that the straps always sit flat and there are no dividers to set underneath your ears. The antibacterial and antimicrobial inner padding – removable for washing and replaceable if it wears out – is made from Coolmax and most of it has a honeycomb inner surface. Along with large ventilation holes at the front of the helmet, it helps keep your head feeling cool and well aired. One of Kask's biggest boasts about the Protone is that it has been designed using computational fluid dynamics software to have one of the lowest drag coefficients of any ventilated helmet – particularly important to the likes of Team Sky, obviously. 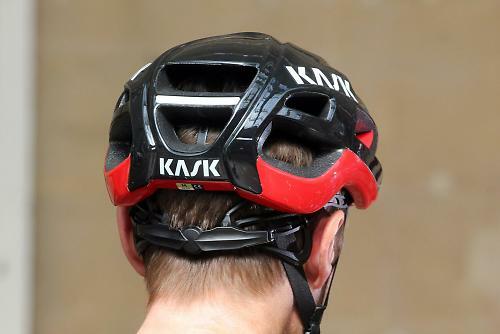 Kask don't put a figure on their aero claims and we're not in a position to provide one, so you'll have to take their word for it or not, as you see fit. It's a pro-level helmet (it debuted with Team Sky at the 2014 Tour de France) designed with heat dissipation and aerodynamics in mind. The innovative 'in moulding' technology, joining the inner polystyrene cap to the outer polycarbonate one, ensures a better shock absorption. I really like the fit system and the strap construction. It's in-moulded and should last a long time if you treat it well. Top end helmets are never especially good value in that they essentially do the same job as far cheaper ones, but you do get some good features here and the build quality is great. The fit system and the straps. The price is high, although in line with that of high end helmets from other brands. Would you consider buying the product? I think I would. It's expensive, but the all-round quality is really high. You might argue that the high price should drag other overall mark down a point, but the overall high quality you get across the board here justifies a 9. How do ratings of 9, 9, 7, 8, 9, 7 result in an overall score of 9? I'd accept mitigation of the 7s for durability and value if you'd scored it 10/10 for quality or performance (or anything). "The MIT Technology, applied to all KASK cycling helmets, guarantees a higher safety and a complete protection thanks to the polycarbonate layer that covers the shell on the top, on the base ring and on the back." This is the only part of the review that mentions the helmet's primary purpose. Can you be more specific about the enhanced safety specification? Given that the EU cycling helmet standard is so poor, and one reason why riders say helmets only offer modest protection, it would be good to know which manufacturers are investing in increased safety and how much more effective their products are than the basic standard. Thanks. Looks nicer in the black and red colours than the Team Sky version I reckon. That one always looks like they have it on back to front to me. Looks as if the same tester also tested the Giro Synthe, which this is pitched squarely against. Same promise, same price point. Of the two (and I know that our heads are different shapes) which should I own? Hi stuartforrest, yeah, that's a good question. In terms of protection, we simply can't tell you which will work best for you. Sorry. Although that’s the primary purpose of a helmet, we don’t have the specialist facilities to test that. We just have to trust the safety standards bodies and report any manufacturers’ claims, making clear that they are manufacturers’ claims. I’m a longtime Giro wearer but I must say that I’ve been won over by the fit and feel of the Kask. I’d happily own either but the Kask edges it for me because it feels a more secure and comfortable fit on my head. The trouble is, that might not be the case for you because, as you say, head shapes are different. Really sorry not to be able to give you a definitive answer. One. Don't all cycle helmets have a polycarbonate/plastic shell to hold the expanded foam in place and stop the helmet disintegrating when you try to put it on? The foam is the protective element not the shell. Two. MIT Technology? I know I could look it up but I shouldn't have to. I therefore deem it to stand for Mouse in Trousers Technology. Well it makes the same amount of sense as three random letters taken straight from the brochure. Three. [And yes I do know and accept that you don't have testing facilities] In keeping with all helmet reviews there is an awful lot about comfort, ventilation, cooling and lightness but almost nothing other than passing references to whether it gives better head protection than a Aldi/Lidl £5 special offer. To be fair you have to look very hard indeed to find any mention of testing and safety standards on a manufacturers website (that's if they're there at all). Apart from that not a bad review for a not too bad looking lid. Thanks Mat. I've also been a long time Giro wearer but I'm currently in (under?) a Kask Mojito. It's fine at this time of year and is a comfy fit, but in warm weather I find that it's not good enough at ventilation and that the pad reaches capacity very quickly. Off to my LBS to try them both on I guess. No we don't! This is not about being pro or anti helmet. This is about clarity. For the sake of repetition. I am not pro or anti helmet. I am pro informed choice. I do not wear a helmet for my everyday cycling and training. My Choice. If your event states that I must wear a helmet to participate then, I wear a helmet. It is my choice to enter your event just as it is your choice to insist that I wear one. But I have no illusions as to the protection it offers and I am aware of the increased risk of torsion injuries. If you want to wear a helmet or wearing a helmet makes you feel more comfortable then wear a helmet. That is your choice. If you want to spend £300 on a helmet then pay £300 for a helmet. That is your choice. We are a broad church with many opinions. All are valid. Before going on about standards look at the helmet dot org site and check the facts about standards. All helmets are designed to protect to the standard to which they are tested. I read this review to see if this helmet is worth getting knowing that it has passed the protection test. I'm still waiting to see how good mips protection is going to be. "EN1078 is a standard that is set so low that you would think that manufacturers would be falling over themselves shouting about how far they exceed the standard. " @levermonkey: agree 100%. The present situation reminds me very much of car marketing in the 1980s. All adhered to (weak) minimum standards. Nobody mentioned safety except Volvo. When the market eventually demanded higher safety standards Volvo were very well positioned. "There are plenty of helmets that dramatically exceed EN1078". @Pierre: where can I find more information about them? Which company is the Volvo of cycling helmets? I couldn't give a toss about the helmet debate, wear one, don't wear one. Whatever. That wasn't my point, I wrote 'Here we go again' as it was heading down a similar path to the Giro Synthe comments: i.e. comments regarding no mention in the review of how well it protects. It meets the standard, great. Now what else does it offer the RACER it's pitched at? That's why there's plenty of mention of aerodynamics, comfort, weight and ventilation. 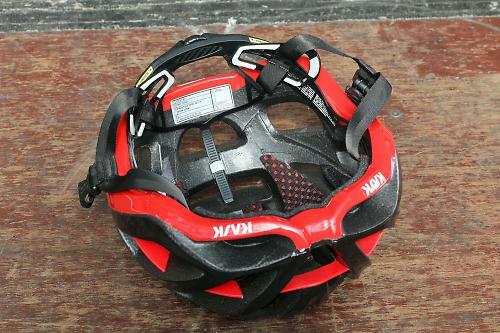 It would be very helpful if road.cc in the helmet reviews could please list which sizes are available for the helmet. This would save me a lot of searching to figure out if I should even be interested in the helmet due to my high percentile score in head size. It's worth noting that Kask to a half price crash replacement scheme as well. Send them your old Kask helmet and you can buy a new one at half RRP. Did you try this or the Giro Synthe with a cap underneath? Looking for a new helmet and tried on both the Mojito and Vertigo, best fitting helmets ever. However, read some issues about the arms of sunglasses not sitting properly because of the retaining system being so close to the back of the ears. Sure enough when I tried the helmets with sunglasses they pushed the sunglasses forward, something that would really irritate me. I so want a Kask, but not willing to compromise on my sunnies. Please tell me they have fixed this issue with the Protone. Bloody hell. Don't give all their secrets away!